This still from an animation shows a close-up of the powerful jets coming from the young protostar IRAS 18162-2048. The jets of polarized radiation are similar to ones created by stellar and supermassive black holes. Supermassiveblack holes at the hearts of galaxies have phenomenal cosmic jets. So do smallstellar black holes. Now a baby star ? one that?s still forming ? has beenfound to rely on the same mechanism to produce its own jets. 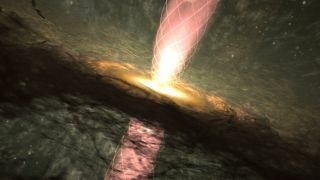 Thesecosmicjets spewing from the protostar, which is about 5,500 light-years from Earth,suggest that despite the huge differences in scale, supermassiveblack holes, stellar black holes and young stars all rely on magneticfields and shock waves to focus and accelerate charged particles to near light-speed. "Ourdiscovery gives a strong hint that all three types of jets originate through acommon process," said Carlos Carrasco-Gonzalez of the AstrophysicalInstitute of Andalucia Spanish National Research Council and the NationalAutonomous University of Mexico. Carrasco-Gonzalezand his colleagues trained the Very Large Array radio telescope to take acloser look at IRAS 18162-2048 to follow up on earlier evidence that theprotostar had a cosmic jet about 17 light-years long. One light-year is thedistance light travels in a year, about 6 trillion miles (10 trillion km). Theresearchers had to scan the jet for 12 hours to spot faint signs ofpolarization, or electromagnetic fields oscillating in the same plane. This polarizedradiation is emitted when electrons move at near light-speedthrough a magnetic field. Researchershad previously detected strong polarization in the relativistic jetsfrom supermassive black holes, as well as from smallerblack holes and neutron stars, but they hadn't seen it in the much slower outpouringsfrom young stars. Thesediverse objects have a common feature: a massive central body surrounded by adisk of more diffuse material, called an accretion disk. Accordingto theory, the bending, twisting magnetic fields around such objects sweep upcharged particles from the accretion disk and focus them into jets. Fast-movingshock waves then accelerate some of the particles to near light-speed. Foryoung stars, "it was unclear if it is possible to accelerate some of theelectrons up to relativistic velocities," Carrasco-Gonzalez said. Theresearch is detailed in the Nov. 26 edition of the journal Science. Ina commentary accompanying the new study, Tom Ray of the Dublin Institute forAdvanced Studies wrote that even though the shock waves in a young star's jetsare relatively slow, they are apparently powerful enough to dramaticallyaccelerate some charged particles. Raynoted that young stars could therefore serve as test beds for theories ofcosmic ray formation, which also are based on the idea of acceleration by shockwaves. Some cosmic rays may even be born from young stellar objects, hespeculated. Scientistsinvolved in the study said the findings would have other applications, too. "Inthe future, combining several types of observations could give us an overallpicture of how magnetic fields affect the young star and all its surroundings,"said study co-author Luis Rodriguez, an astronomer with the National AutonomousUniversity of Mexico. "This would be a big advance in understanding the processof star formation."